Mr. Burke has been teaching since 1994. He has been at Spring Brook since 2010, having spent the first 16 years of his career at McCarty Elementary, teaching both 4th and 5th grades. Prior to entering the teaching profession, he worked at the Chicago Stock Exchange for nine years. He has a Bachelor of Science in Finance from Northern Illinois University and a Master of Arts in Teaching from National Louis University. He feels that one of the best aspects of teaching is the chance to learn new things along with his students. His wife, Lisa, has taught 4th grade at Naper School for over 30 years. He has two adult children – Kelly and Kevin. In his free time he loves to read and spend time with family and friends. 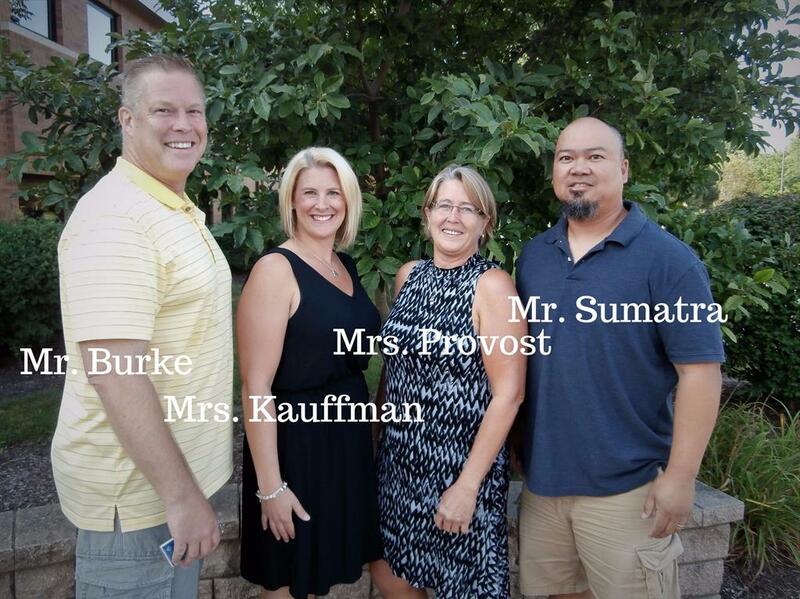 Mrs. Kauffman began her 5th grade teaching career at Spring Brook Elementary in 2006. Before becoming a classroom teacher Mrs. Kauffman worked as a Permanent Sub and Teaching Assistant in the District’s B.A.S.I.C.S Program. She attended WIU for her bachelors in Elementary Education, received her Masters in Educational Leadership with a Type 75 from Concordia University, and also has an endorsement in reading. Mrs. Kauffman is the Team Leader for the 5th grade team and enjoys being able to work with such a great group of educators. She loves teaching because each day is a new adventure, the kids are full of energy, it is amazing to see her students grow academically, socially, and emotionally. She loves to learn new things from her students. In her free time she enjoys reading, cooking, and spending time with her family and friends. Mrs. Provost has been an educator since 1987. She began her teaching career with junior high school, fifth grade, and third grade students in School District 124 in Palos Heights. She joined IPSD 204 five years later when she became a pioneer at Gregory Middle School teaching computer skills to middle school students. After seven years at the middle school, she began teaching third grade at Builta Elementary School and then moved up to fifth. 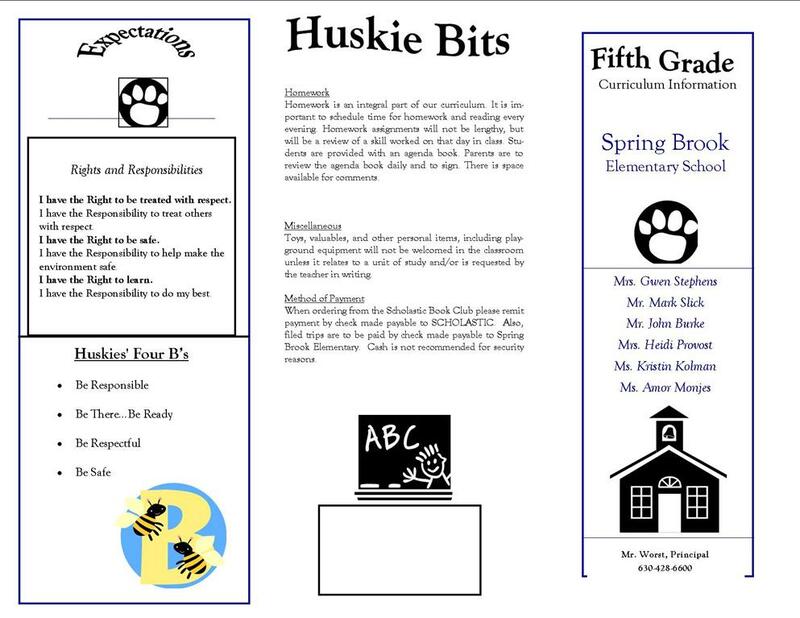 She remained at Builta for nine years until she joined the Spring Brook family were she again taught fifth grade. She attended the University of Illinois where she earned​ her Bachelor of Science degree in Elementary Education and then Illinois State University for her Masters in Curriculum and Instruction. Mrs. Provost loves teaching her “other” children especially when she sees their light bulbs go on. In her free time she loves spending time with her daughter, Bobbi, son, Billy, and husband, Bob, at all of their sporting activities and family adventures. Mr. Sumatra has been an elementary school teacher since 2005, beginning his career in education teaching fifth grade students in Hickory Hills at District 117. Prior to teaching, Mr. Sumatra worked for several different companies including Motorola, Aon, and Sabratek Corporation. Like Mr. Burke, he has a Bachelor of Science degree in Finance (Southern Illinois University) and a Master of Arts in Teaching (Olivet University). Mr. Sumatra loves people, sports, reading, and music; and often tries to integrate these passions in his teaching. He finds it rewarding when students learn something new and can't wait to show or tell someone about it. Having three young children, Amelia, Zachary, and Mallory, his wife, Kari is constantly looking for ways to entertain the four kids and control the laughter.